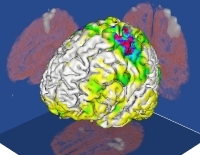 In functional neuroimaging, the goal is to detect significant changes in brain activity. In this project, wavelet techniques are applied for denoising the data in order to enhance statistical power during the analysis of the data, and for reconstruction of the haemodynamic response function. For denoising, we simulated a fMRI series with a time signal in an active spot, and tested the wavelet denoising methods on noisy copies of it. Wavelet-based denoising methods that introduce less smoothing preserve the sharpness of the images and retain the original shapes of active regions. We also performed statistical parametric mapping (SPM), with false discovery rate control to correct for multiple comparisons. The less smoothing wavelet-based methods, although generating more false negatives, produce a smaller total number of errors than Gaussian smoothing or wavelet-based methods with a large smoothing effect (see picture and last reference below). Wavelet-based denoising of simulated fMRI data. The picture shows Statistical Parametric Maps of the area surrounding a simulated active spot. The original images contained white noise with a spatial SNR of 11dB. This project was part of a NWO/GBE National Project Wavelets and their Applications, with H. Heijmans (Centre for Mathematics and Computer Science), H. ter Morsche (Technical University of Eindhoven), C. Traas (University of Twente). Alle Meije Wink, Hans Hoogduin, and Jos B. T. M. Roerdink (2008) Data-driven haemodynamic response function extraction using Fourier-wavelet regularised deconvolution. BMC Medical Imaging, 8:7, 2008. Aleksandra Pizurica, Alle Meije Wink, Ewout Vansteenkiste, Wilfried Philips, and Jos B. T. M. Roerdink (2006) A review of wavelet denoising in MRI and ultrasound brain imaging. Current Medical Imaging Reviews, 2(2):247�260, 2006. Alle Meije Wink and Jos B. T. M. Roerdink (2006) BOLD Noise Assumptions in fMRI. International Journal of Biomedical Imaging, 2006:Article ID 12014, 11 pages, 2006. Alle Meije Wink and Jos B. T. M. Roerdink (2004) Denoising functional MR images: a comparison of wavelet denoising and Gaussian smoothing. IEEE Trans. Med. Imaging, 23(3):374�387, 2004. Alle Meije Wink obtained his PhD degree on Feb. 1, 2008.